Former South Albany girls head coach and current West Albany boys assistant coach Phil Smith, right, shakes hands with Fred Koontz. Koontz recently wrapped up nearly 50 years of officiating high school basketball games. Basketball official Fred Koontz prepares to throw the final tip in his 50-year career of officiating high school basketball. Officials Kevin Bogatin, left, and Joe Worth, right, talk with Fred Koontz before last week's start of the West Albany-South Albany basketball game. Koontz was honored for his long officiating career. Longtime official Paul McGregor, right, and Mid-Valley Basketball Officials Association Commissioner Dave Brooks present Koontz with a basketball during a ceremony after tipoff at last week's game. 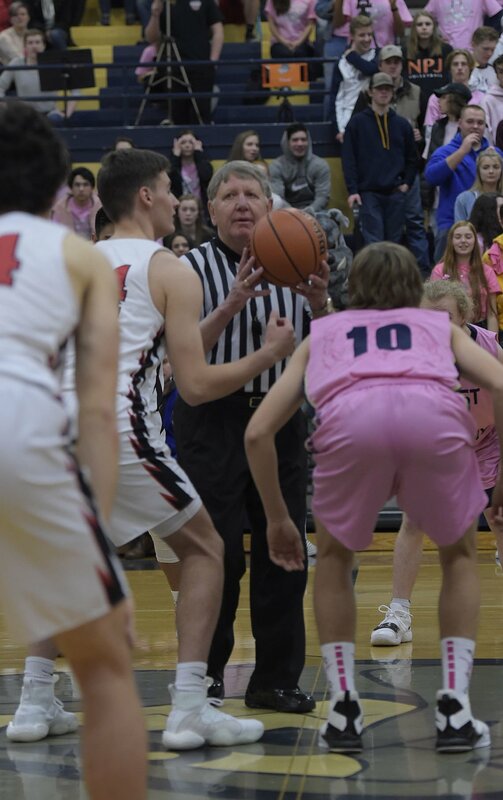 Last Tuesday night, during the game between West Albany and South Albany high schools, was the first time Mid Valley Basketball Commissioner Dave Brooks saw long-time officiant Fred Koontz close to tears. Koontz was being honored for his long career that stretched just shy of 50 years. “Oh, my,” was Brooks' response when asked to reflect on Koontz's time as an officiant and the 19 years he’s known him. Calm. Driven. Enthusiastic. A student of the game. That’s how former and current coaches and the member of the local athletic community described Koontz over and over again. Koontz, a retired accountant, officiated his first game around 1966 on the Oregon coast. Since then, he’s run the 94 feet of a high school basketball court thousands of times. His final game came last year. “It was the last game of the season and I got run over. Down in Monroe. My doctor said, ‘Maybe don’t go do that again.’ So, I retired,” he said. But between that first game on the coast and the last in Monroe, Koontz said he’s seen students make it to Division I schools and coached summer leagues that turned out professional players. He’s had parents and superintendents come out onto the court to question his calls. He’s seen chaotic play (from freshman boys who are notoriously difficult to officiate, he says) and games with more finesse. He’s seen kids get bigger and faster and technology and coaching change. But one thing, he says, remained the same and kept him coming back for 50 years. “There’s nothing like high school basketball. The atmosphere is just great, especially if you go to the small schools where these teams are the center of attention,” he said. But he said the size of the school never factored into how Koontz officiated the game — a claim backed up by former West Albany coaches Dwayne Barrett, Dean Roberts and Mike Haberly. “He would never let his ego get in the way of his officiating,” Haberly said. That officiating earned him his reputation as being fair and consistent, something he’s now passing on to other officiants. Koontz has taken to evaluating other officials who request his advice. Koontz, who has also been involved with the local Boys & Girls Club and Rotary Club, still watches college basketball and will go to games now and then but has taken up traveling. He’s been as far away as Russia and Spain and visits his children — both doctors — a little closer to home. When asked about the ceremony on Tuesday night, he says it was great and he appreciates it but that it “wasn’t a big deal.” He did it for fun, he said, not the attention. “These kids are giving their best effort and so officiants need to go out and give their best effort too,” he said. CLAIM TO FAME: Officiant with the Mid Valley Basketball Association for 50 years. WHAT’S NEXT: Continuing to travel and enjoying retirement. QUOTABLE: "My motto is to manage a game and not control it."